Throughout the Gospel of Matthew, Jesus is portrayed as the "New Moses." How is this theme evident when you compare the two readings? Regarding Jesus' transfiguration, what other elements of the story stand out for you? Why does Jesus instruct the disciples to keep quiet about what they have seen? What does the word "transfiguration" really mean? May the following prayer, written by Bruce Prewer, bless you as you journey forth this week. Jesus' higher standard for his disciples is made clear--we are to perfectly manifest the love God has for all persons. This call to love extends even to our enemies. The love demanded here has nothing to do with reciprocal relationships; rather, it is a matter of giving with no thought of return. God the Father is characterized as an indiscriminate lover and blesser of both the evil and the good, giving to both the sun and the rain needed for crops and sustenance. How difficult is it to love someone who has mistreated you? What is your general response should you encounter that person again? How does our ability to love compare with God's? 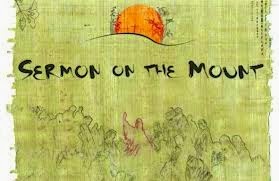 What do you find most challenging about the Sermon on the Mount, in general? I pray you are having a good week and look forward to worshiping with you Sunday. Our gospel reading for Sunday, February 16th continues Jesus' Sermon on the Mount. Read through Matthew 5:21-37 at least three times using the spiritual practice of Lectio Divina. In this type of reading, the text is engaged slowly and prayerfully, taking time to sit quietly in between each reading. In the silence, listen for the word, the phrase, or the teaching the Holy Spirit might have for you at this juncture in your spiritual journey. This passage speaks of blessings and curses, life and death, good relationships and those that are broken. Herein, does Jesus suggest we have a choice in these matters? If so, how? Where do you find life and where do you not? What role do your choices play? Where have you experienced broken relationships in your own life or in the church? How do Christ and the reign of heaven enable us to move beyond brokenness and live in mutual support? As always, I look forward to worshiping with you. Until then, may your week be filled with courage, wisdom, and blessings. In preparation for worship this Sunday, February 9th, take some time to simply reflect on the art provided above. What do you notice about the painting? What draws you in? What do you like best about it? How does gazing at it make you feel? Now, turn to the Scripture readings for Sunday that include Isaiah 58:1-9a and Matthew 5:13-20. First, read through the passage from Isaiah. Herein, how are false religion and true religion described? In verse 9, what is stated as the consequence of true religion? 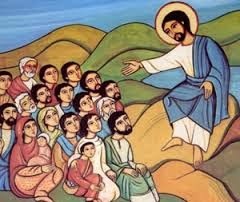 Finally, turn to the gospel reading which is part of the Sermon on the Mount. What are the topics of Jesus' address? How are salt and light portrayed? In Jesus' eyes, how righteous are the scribes and Pharisees, really? What does the word "righteousness" mean to you? In your own faith journey, how do you live your life as salt and light? Is there a way in which you feel God is calling you to be "saltier" or more of a "light-bearer?" On your journey toward Sunday, allow time to simply be with God and quietly listen to what message God might have for you now, at this very moment of your life. As always, I look forward to the next time we gather to worship our Lord and Savior. and lead you in the way that is everlasting. Amen.